For more than 25 years, lawyers at Watson, Soileau, DeLeo & Burgett, P.A. have been successfully serving clients in Cocoa, Florida, nearby Merritt Island and Titusville and throughout the Central Florida area. Watson, Soileau, DeLeo & Burgett, P.A. represents clients in all cases of estate planning, wills and probate, real estate, and civil litigation. We are an established firm and highly respected within our community. Attorney John L. Soileau has been recognized by peers with the AV® Preeminent™ Peer Review Rated by Martindale-Hubbell® for professionalism and ethics, and three of our partners are BV® Distinguished Peer Review Rated by Martindale-Hubbell®. If you are assuming duties as executor of an estate, need help with title insurance for a real estate transaction or are facing litigation for a breach of contract, attorneys at Watson, Soileau, DeLeo & Burgett, P.A. have the skills to handle your case. Experienced representation — Founded in 1984, Watson, Soileau, DeLeo & Burgett, P.A. has been serving Central Florida clients for more than 25 years. Our lawyers draw on their rich record of case histories to identify winning strategies for our clients. They are skilled both in the courtroom as litigators and outside the courtroom, where they negotiate a settlement whenever that path is most effective for your case. Specialized knowledge — Attorneys at Watson, Soileau, DeLeo & Burgett, P.A. are well-respected among clients and peers for their qualifications, experience and success in real estate law. 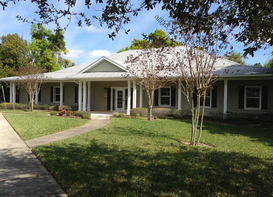 Three lawyers are board certified in real estate in Florida, and the firm also operates as a title insurance company. Our attorneys have authored real estate articles for the legal community. Their depth of experience in this area prepares them to handle the most complex cases. Superior reputation — Watson, Soileau, DeLeo & Burgett, P.A. has earned the trust and respect of clients and lawyers. Clients come to us for our well-known skills and experience. Our reputation precedes every litigation and mediation and benefits our clients from the start. Watson, Soileau, DeLeo & Burgett, P.A. represents all types of cases in estate planning, including wills and probate, commercial and residential real estate, and civil litigation. Whether you are planning for the protection of generational wealth, defending your condominium association in a lawsuit or trying to recover lost wages following a car accident, the lawyers at Watson, Soileau, DeLeo & Burgett, P.A.are prepared to take your case. Call Watson, Soileau, DeLeo & Burgett, P.A. at 321-631-1550 or contact us online for an initial consultation on the facts of your case.